Handmade Doll Holding a Cat by Bearing In Love 24"
Brand New 2019 Santa! Made In USA! These wonderful handmades are crafted in limited quantities and once we sell out then there will not be anymore! He is mounted on a wood base with Arnett's County Store stamp on the bottom to show his authenticity. These are currently being crafted now and will begin to arrive in February 2019. We are taking pre-orders for these as they will sell out very quickly. Anyone that pre-orders these will get priority on them and they will be delivered as soon as they are completed. 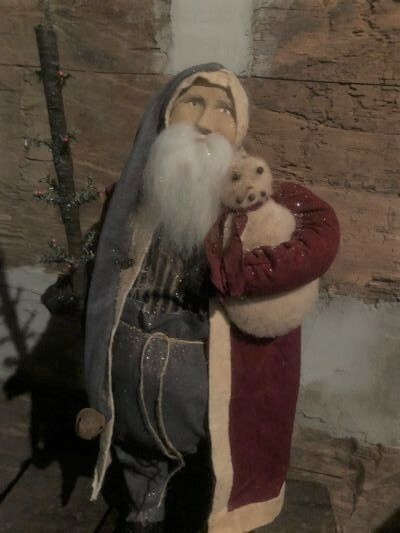 Arnett's Santa Wearing Navy Homespun Coat Holding Pinecone and Candle 23"
Arnett's Santa Light Brown Open Coat Holding Lantern and Tree 29"